Environmental Monitoring is crucial to ensure that products, facilities and water meet safety and efficacy standards for public health. Efficiently manage your program and easily trend data. 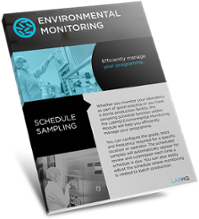 The Environmental Monitoring module provides manufacturing organisations with management of batch and non-batch related monitoring of sterile environments. Easily set-up schedule and alerts to routinely monitor locations and operators. Flexibility to add multiple tests to an existing sample were growth requires identification. Immediate notification where test results have reached alert and action levels. Track lab investigations ensuring full sample history is recorded and audit trailed. Configure the module with LabHQ to monitor locations in compliance with regulations. The module creates test schedules and monitors cleanliness. It also analyses multiple samples and includes location or operator information so deviations or bacterial growth are quickly identified and isolated. The Environmental Monitoring module is crucial to ensure that products, facilities and water meet safety and efficacy standards for public health. Download this leaflet to learn more about our Environmental Monitoring Module.